3. 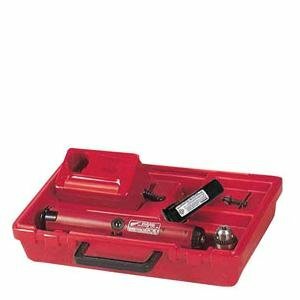 Milwaukee 0622-2418 Volt 1/2"
4. 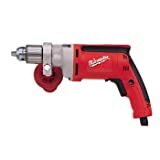 Milwaukee 0624-24 18 Volt 1/2"
9. Milwaukee 0616-24 14.4 Volt 1/2"
Very nice design, extremly well built! Worth every penny ! Upon receiving this package and opening it, I was enjoying it like a little kid in the candy store. I can not say enough how this tool is nice and well built. I have the smaller brother, 5615-20 as well. After having used that router for a couple of years, and enjoyed every minute of using that nice piece of engineering, I decided to invest in the big brother for my router table, that I am going to build. And boy, I am not disappointed a second! The most valuable feature of the router is, it's fine adjustment design, that makes fine tuning of the depth of the cut, only a pleasure. I have to say that I have tried and tested other brands and makes as well. But this design beats them all, hands down. The fact that you can remove the motor from the body with the snap of a latch handle is another major advantage for me. This means that you can use the body that came with the unit and mount it permanently in the router table and just buy a second body, should you need the router for freehand operations. The electronic feed back system is not a joke and works exactly as advertised. I could hear how the engine reved up when I ran the router through some hard oak and maple and compensated for the load. Smooth start makes the router feel like a very well behaved machine that has no tendency to jump out of your hands flying around the shop, when you start it in free-hand mode. The package includes the D-handles, knobs, and over the table depth adjustment key that makes the picture complete. Overall, very nice design, extremely well built. Worth every penny! The engineers must be proud of their work! Good job guys/gals! If you purchased one of these machines,,,,be aware that the raising and lowering mechanism is susceptible to slipping. Milwaukee has come up with a solution so that it will not slip or you can have it correted at an authorized repair center. The new ones that are being manufactured are already corrected. Unfortunately I purchased one of the first ones made. It worked great for 6 months,,,,,then slip, slip, slip. Other than that, I really like the machine. It is a horse that performs beyond expectations. What can I say it's a Milwaukee tool. Have had this router for about 6 months. Haven't used it on many freehand operations(any bits need 3+ HP shouldn't be done freehand), but under the table this tool has produced flawless cuts with mediocre bits. I have ran horizontal panel raising bits with backcutters and couldn't even get a hint of a bogging motor. One downside if you see it as that is the similarity of a jet engine noise level(but I see this as proof of it's tremendous power). The soft start works great. The only other thing I see wrong with it is when mounted to a 3/4" MDF board for table operation some bits just barely have enough clearance, but this goes for pretty much any router. 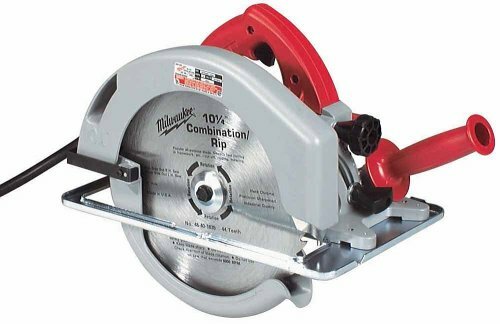 Milwaukee's depth adjustment is far above the rest in my opinion, because the actual router body is not turned, a definite plus for table operation(controls are always in the same stop. I haven't used the above the table access much but when I do it works great. I would have to say if you have the money to spend this router is definitely worth the price. It can handle anything thrown at it(including shaping operations). Definitely 5 stars!!! This is a horse of a router. I bought it on a salesman's recommendation over another router I had spec'd out for primary use on a router table. I haven't yet mounted it in the table, but have used it for other handheld functions. What I can say is WOW!!! The power this thing puts out is remarkable. I had no trouble routing a 3/4" 1 inch deep channel in MDF that would normally take me two(or three) passes with my old one(1 1/2hp). Using it to edge Oak trim is wonderful. I haven't bogged down this router yet. The soft start feature is great. I would very highly recommend this router, in fact, just because of this one, I'm going to buy the d-handled 1 3/4 model. Received the Milwaukee 0622-24 Kit today. Haven't used it yet. It MAY be a fine tool, but it is NOT made in USA. The drill is made in the Czech Republic, the batteries in Japan and the charger in China. Be forewarned that you are paying a lot for the name and if it is important to you to buy American-made products, this is NOT one! I'm very disappointed and will not buy Milwaukee again. 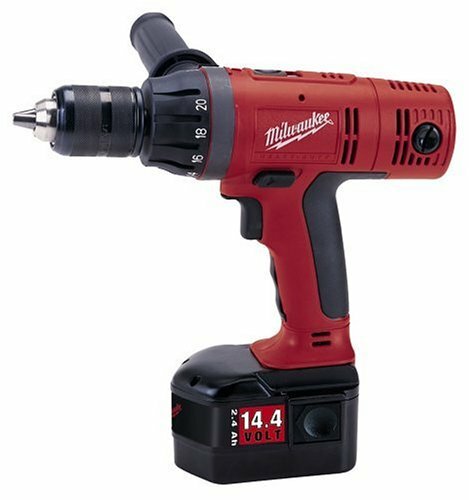 I thought I had a good cordless drill until I purchased this Milwaukee 0622-24 1/2" drill. This is without a doubt, the most powerful,easy to handle,high torque cordless drill I have ever owned.Period. Everything about this drill is heavy duty including the chuck which is easy to use one handed.If you're looking for a cordless drill that can do it all, look no further,no manufacturer out there can compare with this Milwaukee and best of all, Made in the good ol USA. Five year warranty on this tool.The battery life is long lasting and recharges in only one hour. I highly recommend this Milwaukee, you won't be disappointed with this titan. No one else come close in quality and features. I have owned a Makita, De Walt, Porter Cable, Bosch, and Panasonic 18 volt cordless drills. The Bosch was hard to part with but, I realized I made the right decision after I bought the Milwaukee. It is simply the lightest, most durable 18V drill I have ever used. The batteries last longer, the torque is better, the chuck is indestructable, and the "MADE IN THE USA" stamp pretty much sold me. I have dropped it, left it out in the cold, left it in the heat, and have built 12 decks with it. Only twice did I even have to use the other battery. Bosch comes very close. In my opinion, the others don't even compare. For the last 2 years, I have been busy! I mean, REALLY busy, renovating our house. From decks, to fences - inside jobs / outside jobs. Bottom line: I have "wasted" a couple of drills in the process and wanted the best. NO DISAPPOINTMENTS HERE. Got a couple of more projects going, and this "piece" has performed better than expected. Aside form the Milwaukee name, this thing gives you a feeling of confidence that simply states "There is nothing too tough to handle". A nice feeling when you don't want to be interupted by a failing tool. Nice work, Milwaukee! I'm on my way to buy the 11 amp orbital Sawzall based on my experience with this "work of excellence"! I bought this drill after reading several reviews in woodworking magazines and this forum. There just aren't enough adjectives to describe what a work of art and workhorse this drill is. Enough power to satisfy even Tim Allen and yet it doesn't have a bulky, over-weight feel. From the lowest torque settings all the way to the hammer function, the gear action is as smooth as glass and it _never_ feels like it's running out of gas even drilling into hard metal. You can't go wrong with this tool. Once you use it, you'll be a Milwaukee convert for life. This is what five stars are all about! What a pleasure to use a very well made tool. Milwaukee's reputation for heavy-duty quality is again backed up by this top-of-the-line cordless. I've been driving screws with it building a shed, and the battery life is really impressive. Grip feel, balance, torque and overall sense of quality are great. A quick rant about tool cost (and it's not like Milwaukee is particularly expensive in the first place): I'm constantly amazed at people who will pay $25 for a meal, a cab ride or a few drinks without thinking twice, but will balk at paying a bit more for a tool that will last a lifetime! Think long-term: Reward excellence; treat yourself and buy quality -- whatever the brand. If you are looking for a cordless that can, look no further. I bought it primarily on it's performance specifications, and have not been disappointed. A big factor for me was speed. My old model topped out at 1300, and most of the competitors are in the 1400 to 1550 range (other than a yellow 3-speed model). I appreciate a unit that can twist at 1700 rpm but still have plenty of torque when you need it at the low end. Another important spec for me was the battery life. Haven't had it long enough to judge yet, but I presume the 2.4 ah should need less charging. In addition to motor & battery performance, I was highly interested in chuck performance. (This is probably the main reason I wanted to relegate my old unit to backup). The Milwaukee chuck has performed wonderfully, gripping shanks of all sizes like a mad pit bull. I also appreciate the reversable battery mount, which amazingly eases the hand strain when you are drilling overhead( By lowering the center of gravity to below your grip). My only possible reservation about this model is durability. It just doesn't look as rugged as the Bosch model I looked at. I don't plan on dropping it, but you never know when your going to set it down in the wrong place at the wrong time. Another reviewer said he dropped it from a step ladder with no ill effect, however, so maybe it's tougher than it looks. One of the finest tools i've ever used. reliable with Power to spare. A bit on the expensive side but well worth it. 2 batteries included. I bought this beast about a year ago to replace a DeWobble DW959K-2 (please see my review of that, uhh, *worthy* offering). This should have been my first choice but I let a _friend_ talk me into the yellow. This is quite simply the best 18V HD on the market. It's got more torque (495 in/lbs, a little over 40 ft/lbs!!) than many corded drills and as one reviewer already noted, will probably sprain your wrist before it gives up driving. It is a _bit_ on the heavy side but no more than any comparable Bosch or yellow equivalent and the batteries are cheaper to replace and longer lasting than either of those. So far I've used it to build a deck, rennovate two bathrooms, too many woodworking projects to list and I'm still using the original two batteries. I've dropped it numerous times, more than once onto concrete and one time for sure it landed right on the chuck, and it still works/sounds like brand new. One of the features I really like is the reversible battery pack. They make getting into tighter places (like in between joists) easier. The squeeze buttons on the battery packs do require a bit of finger/thumb strength but they aren't much problem for me and have gotten easier with time. The five year warranty is also nice, I think only Hitachi offers a similar warranty. For years, Milwaukee's Sawzalls have been valued for their outstanding ability to cut through almost any material: wood, nail-embedded wood, steel, cast iron, aluminum, brass, drywall, composition materials, hard rubber, cement, brick, plaster, and fiberglass. This 11 amp Super Sawzall has a standard blade stroke mode, plus an orbital stroke mode for more aggressive, faster cutting of thick wood. You can choose the level of orbital action, too, to fit the application--or you can switch it off for cutting in metal. Like almost all reciprocating saws, this Super Sawzall also has variable-speed control (with a speed control dial) for versatility, control, and increased efficiency over a wide range of applications. For those of you who've grown up with Sawzalls, you'll appreciate the addition of the handy Quik-Lok blade clamp, which lets you change blades quickly without having to use a hex wrench; this feature is especially convenient when you're cutting hard materials, such as steel, a situation in which blades break frequently. There's also a handy quick lever adjustment for the shoe. The Best Sawzall Ever Made! I had a Makita for 13 years that wasn't too bad, but it finally died of bad bearings. The repair cost was within $10 of replacement so I started shopping. 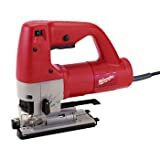 I was going to get the 10 amp Super Sawzall, but after reading toolpig's review and considering the advantages of orbital action, I bought this one. It was only $5 more. I will never be sorry! My first project was cutting up a bunch of rebar to use spiking railroad ties down. Over 100 cuts (with a Lenox blade) and I wasn't tired and neither was the saw. I slowed it down with the speed dial to keep from burning up my blade. I never realized how handy this one feature would be until I used it. You can get precicion control over top speed without having to finesse the trigger. Just set the max and pull it wide open - no more overspeed burns! Next I was cutting railroad ties with a 12" Lenox blade. I started out in the straight cutting mode and it was slow after the first inch. I switched to orbital action and the blade just about fell through the wood! I was making straight cuts and miters on 8" x 10" ties with no problem. I had used a chian saw in the past, but railroad ties always have a "suprise rock" right in the path of your cut. The recip blades are basically disposable, so you can save the chainsaw for less risky duty. This saw runs smooth and quiet, no user fatigue after hours of use. The adjustable shoe is real handy, another feature new to me after the Makita. If this tool lasts as well as it runs, you'll never need another recip saw. I don't see how they could come out with a better tool, unless it would run itself on voice command while you sat back and watched! Maybe next Millenium. Everyone knows that sawzalls can cut through almost any material: wood, nail-embedded wood, plaster, metal, (steel, cast iron, aluminum, black pipe, conduit, etc.) drywall, plaster,... you get the idea. When I used this to cut through floorboards and 2x4's it was as smooth as a hot knife through butter. Unistrut and allthread were also no match for this machine. This 11 amp Super Sawzall has a standard blade stroke mode, plus an orbital stroke mode for a faster, more agressive cut through thicker wood. You can also adjust the amount of orbital action from none to full depending on the application. This sawzall also has the new Quik-Lok blade clamp with allows you to change blades in seconds rather than minutes. There's no more searching for a hex wrench to change blades here. I've been using sawzall's for quite a while now and I have always admired Milwaukee Sawzalls for their dependability and durability. When I finally had to replace my old one and discovered that Milwaukee had introduced a new sawzall to their line, it was a simple choice for me. The added power and easy of use make this an idea choice if your building something new, tearing something down, or fabricating something for a job. 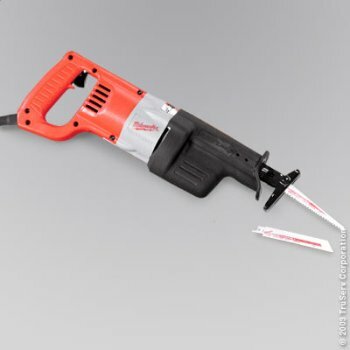 I would highly recomend this product to anyone who wanted to purchase a sawzall. Might as well buy the Milwaukee--It IS the Best! 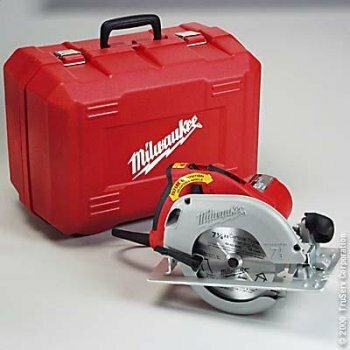 There are a lot of reciprocating saws on the market today; unfortunately some masquerade as a 'Sawzall', but Milwaukee invented the genre decades ago and, quite frankly, nothing is even in the same league as a genuine 'Sawzall'. DeWalt, Makita, Ryobi, Hitachi, Porter Cable all make reciprocating saws; some are professional grade, some say they are and some are just consumer models. When you decide either through using lesser tools or simply want to own the very best, Milwaukee stands head and shoulders above the competition in the reciprocating saw market. 11 amps of power and it feels like more. This is one big, robust saw, period. Detachable cord. Only Milwaukee figured out the ways people use a reciprocating saw--constant, demanding ROUGH use. These saws are most typically used in demolition work. In this environment you run the saw relentlessly and go through some blades. When you want to change one, in a hurry, nothing on earth is handier than being able to simply unclick the power cord and do a blade change. Believe me, you wouldn't want to change a blade on this beast without it being unplugged. Orbital action. When you're rough cutting lumber, nothing assists you like an orbital action. This allows the blade to more aggressively cut through the material with less binding and less discomfort to the operator. Anti-vibration. I don't know the technical nuances of how Milwaukee cancels out the vibration, but this saw is the smoothest (from an operator's standpoint) saw I've ever used. Any recip saw can truly rattle your fillings when it binds, but fortunately this Milwaukee has anti-vibration and a clutch, that genuinely minimizes feedback to the operator. Easy blade change chuck. This has got to be the simplest blade change known to man. Rotate the collet about 1/4 turn and you're in business. NOTHING could be easier. Variable speed dial. What a nice touch! Instead of relying solely on trigger pressure for speed control, Milwaukee thoughtfully provides a speed dial. Set it to half and you can pull the trigger back all the way and run at half speed. Demo work doesn't usually involve feathering the trigger, so this is a godsend. Typical Milwaukee construction. Want to find out how good Milwaukee's reputation is in the building trades? Go to a jobsite. ANY jobsite. Residential, commercial, plumbing, electrical, it doesn't matter. First, stop by and ask any professional what they think of Milwaukee. Second, look for the RED tools (Milwaukee's trademark). Every jobsite has Milwaukee. The pros respect them because they don't break. I brought this tool home on a Sunday and had to cut up 15 pallets to downsize them for garbage disposal. If you've EVER had the fun task of cutting up pallets, you can appreciate that the wood is FULL of nails (everywhere) and it's genuinely very hard, dense wood. Has to be to support the loads that pallets carry. I chucked in a new Milwaukee blade and 30 minutes later there was over 10 pounds (yes I weighed it!!) of sawdust and a BUNCH of small boards left. Saying the Milwaukee cut the boards like a hot knife through butter, in my mind, does a disservice to the hot knife! I ran the saw until it became so hot I couldn't hold it anymore, which is being overly severe to any tool; I just wanted to see if Milwaukee's vaunted reputation was as deserved as people say. It is. The saw NEVER stopped running; I honestly believe I could have put on gloves and kept going, but did allow the saw to cool down and resumed cutting. If a nail was hit, it bucked a little and just went on through it. It's a beast, plain and simple. It's a very specific product, but one with a ton of uses. If you've never used a recip saw before, I would caution you to always make sure your item being cut is safely secured; a recip saw of this size has enough strength to easily move anything that is loosely held. Always be sure of what's under or behind the blade; if it's a concrete driveway or asphalt, you can damage the tool, but REALLY damage the driveway! Wear boots and safety goggles, this thing takes NO prisoners. And for heaven's sake, if you're demo'ing a wall, make absolutely certain that there are no live electrical wires present. This saw isn't for everyone; it's pricey for single, consumer use. But, if you want the very best made reciprocating saw made, look no further than the Milwaukee Super Sawzall. It's the class leader by a BIG margin. The best reciprocating saw period. My wife bought me one of these as a birthday present this year. Can you believe that? It doesn't get much better in my book. The thing works great! I've cut wood, angle iron, rebar, nail embeded wood, flashing nailed to wood and all of it was a breeze to cut through. About the only thing I haven't tried - concrete... I'll have to see if I can find the right blade! In the past I've used Dewalt, Makita and PC reciprocating saws extensively and most others on the market and none of them have performed like this. I think the best part of this saw is the lack of vibration while cutting, it far outperfroms the others. That said, there are also easy blade changes (watch out they're hot if you've just been using them) the detachable cord (love those things, got a couple of other Milwaukee tools with that and it couldn't be better), adjustable shoe, orbital action, and speed control dial. I can't think of anything else they should put on the saw except for maybe someplace to rest a 12 ounce can of something cold. I recommend this without reservation over every other saw on the market today. A hot knife through butter is SLOW! I have used other reciprocating saws in the past but none has impressed me as much as the Super Sawzall. I first used it to demolish a kitchen that I am remodeling. Wood, nails, formica and drain pipes never slowed the blade on the this Sawzall. I used a metal cutting blade for the drain pipes but everything else was cut with the blade that was recommended for nail embedded wood. Since then I have used the Sawzall for several other small projects around the house and it has performed flawlessly. I did purchase the Milwaukee 11-piece blade set but haven't opened it as the two included blades are still sharp and still effortlessly slice through everything that gets in front of them. BIG BEAR WITH SOFT SHOES! I AM A FENCE CONTRACTOR IN SOUTH CAROLINA. I WORK WITH 4X4'S, 4X6'S, 6X6'S DAILY. THIS IS A STRONG SAW AND IT CUT'S 4X4'S GOOD, (ONE PASS), BUT 4X6'S AND 6X6'S YOU HAVE TO MAKE TWO PASSES AND THIS IS A HEAVY SAW WHEN YOU HAVE TO CUT 150 POST A SHOT. THE SHOE IS RIDICULOUS. MY SECOND WEEK WITH IT AND I 'VE ALREADY NOTICED IT'S BENT. MILWAUKEE OWN'S A LARGE AMOUNT OF MY TOOL BOX, BUT THIS SAW WOULD NOT HAVE MADE ME PURCHASE ALL THE OTHER GREAT TOOL'S MILWAUKEE OFFER'S. " PUT SOME NEW SHOES ON THE BEAR! " I have bought and used a lot of tools in my day and this saw has to be the poorest designed saw ever. The height adjustment and steel shoe do not keep an setting or adjustment, I think the torque of the saw will even bend the steel shoe. I thought I could live with this problem but I can't. I have owned it too long to return it, is their a modification that can be made if so help. The only good thing about the saw is the name and power.How can I contact the manufacture directly. PS I wish I would of read the reviews before I bought. I agree with the other raters on this saw. I am a deck contractor and use it to cut 4x6 and 6x6 (takes two passes) posts. The saw has LOTS of power and handles even wet pressure treated posts very well. However, the shoe is a JOKE. It is as flimsy as a $40 Black and Decker circular saw's. Get with it Milwaukee. For this price, the shoe should be MUCH more durable. Hopefully, they will offer a heavier duty shoe as an accessory. for cutting 4x4's in one pass. The shoe however is very flexible, made of sheet metal, and in fact came pre-bent. I guess that was so I did not have to worry about bending it myself. The result is a rounded and rather unstable base. I suggest that Milwaukee redesign the shoe and get it up to the same level of quality as the rest of the saw. A great heavy duty radio! I bought this radio for my carpenter brother-in-law. He has raved about this radio since Christmas. The sound quality is tremendous, far surpassing the DeWalt version his friend has. It has fallen off a workbench without incident! I highly recommed this product to any contractor because of its durability and quality. An excellent radio for a good price. This radio is basically a portable stereo just like any other except it is rugged, looks really cool and runs off a tool battery or a/c. The knobs are large and easy to use with gloves. There is no point in comparing it to the Dewalt unless you are using both companies tools? The pass thru plug is cool, 12v power plug is cool. You can plug your charger or whatever into the back of the radio's a/c plug. Digital tuner with memory function is nice, the punch eq is just ok, only the first setting is really usable with the unit cranked enough to hear over saws, the next few bottom the woofers. The radio has a low center of gravity and a wide bottom so it's near impossible to knock over. It has rubber no slip feet too. It's not really a big deal to me that the radio does not have a charger function, if I have my tools I have their bag with the charger and extra batteries. If I am running the radio off the battery there probably isn't a/c available anyhow. I gave it 4 stars because it deas not have a charging function. Even though that doesn't matter to me, it is a feature that should not have been excluded. Also the price of the radio is similar to the Dewalt that does offer a charging function. 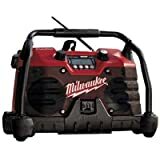 I purchased the milwaukee radio after having both the dewalt and the bosch radios.It has a very good sound and i'm very pleased with it. The only draw back is that if you don't have other milwaukee tools you'll need to purchase a battery and charger and it does not have a charger incorperated in it. for the price it's hard to beat! I heard a crash and then turned around. My radio was lying on the basement floor. I could have sworn I left it on top of the ladder...? Picked it up off the floor and placed it on top of a cardboard box; much more stable. No need to check the radio because it was still running and suffered only a small scratch on the bar handle. This radio is very tough indeed! It sounds great, has good FM and very good AM reception; the weather bands are tough to get but they do work. The unit will run on a Milwaukee cordless drill battery, plus the 12v DC outlet readily charges my cell phone and it has an auxiliary micro input that accepts any stereo source. All in all this is a great radio for a rough environment; though it would be nice to see it also function as a charger. This would allow you to leave your regular battery charger at home limiting the amount of gear you need to haul around. Milwaukee really should have included a charging circuit with this unit. I am sure they could have found a way to include charging without compromising the sound. Really had high hopes for this bad boy, but after using it for a couple weeks I find myself less than impressed with this beast of a radio. The main problem I have is that the sound just isn't very good, and the radio does not have enough power to overcome the noise level on the typical jobsite without severly distorting your tunes. I went for this over the DeWalt because of the Rockford-Fosgate speakers, but I think the only thing that they really added to this unit was a cool badge! The bass definition is really weak, and the "punch" EQ only accentuates the mid-range which is great for AM radio but lousy for music. 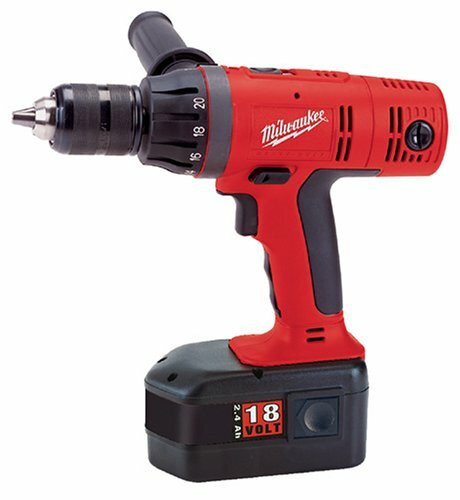 The Milwaukee Right Angle Drill 3107-6 applies allot of torque to spaces you otherwise would have trouble reaching with a regular drill. 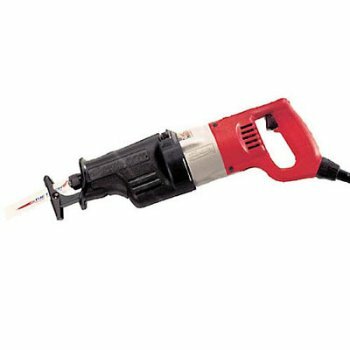 It is ideal for drilling holes between studs for electric, cabling or plumbing. 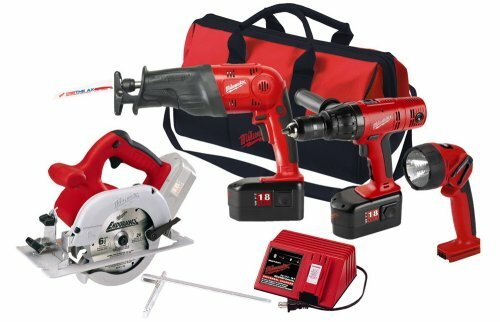 The unit is basically their 7 amp variable speed D handle drill featuring triple gear reduction with a Right Angle Drive (RAD) unit attached that can be set in either low gear at 355rpm or high gear at750rpm. The D handle drill without the RAD will achieve 500 RPM. Changing chuck speed from high to low or visa-versa requires removing the chuck, reversing the RAD unit and then replacing the chuck on the other side. This is fairly easy but it takes about 2-4 minutes and requires a couple of tools that are provided. The Right Angle Drive (RAD) can be easily swiveled 360 degrees providing versatility to meet any drilling angle. Using the drill is a pleasure as it has so much torque it just seems to eat the wood up. No standard hand drill I ever used has this kind of power. The build quality of the unit is of the highest standard and will likely last a lifetime of moderate to heavy use. This model is also fitted with Milwaukee's "quick lock" cord allowing easy replacement in the event the cord becomes damaged. For remodeling, basement finishing, or extensions this drill really shines. Trying to accomplish drilling many holes in wall studs with a standard electric drill would be very time consuming if not impossible for simply not being able to fit one between the studs. If however you do this kind of work every day as a business I would consider either the Hole Hawg or the new Super Hole Hawg. These units are more expensive but feature higher chuck speeds and a transmission that allows you to select the high or low speed without the use of tools. This will allow you to get work done faster when on really big jobs. But for the home owner that enjoys remodeling this Right Angle Drill is really the best choice as it is two tools in one when you consider the D-handle alone with the RAD unit removed. Built like a tank and as much power as you could ever need this drill definately delivers. The only variable will be your choice of bits, I have to place my vote on the Milwaukee self feed bits as they cut very fast and will last a long time between sharpening. So if you have some branch circuits to run or some plumbing to install go get this drill and some self feed bits. It will make the job go much easier. I do not know how I did it before this tool came into my arsenal- It is a monster that makes quick work of boring holes between studs or joists to run pipes or wires. Once you use one of these with a self feed or auger bit, you will never use a standard drill with a wimpy paddle spade bit again for this purpose! This is a great drill for making holes in tight spaces. I have gotton by over the years with a 3/8 inch electric drill and spade bits/hole saws to make all of my holes, but I dislike the spade bits because they take forever and quickly wear out, while hole saws often bottom out when cutting anything thicker than 2 by lumber. But this drill, combined with Milwaukee's and Dewalt's resharpenable self-feed bits, makes drilling holes almost effortless and I can now reach spots that I could not have before. The lower RPMs combined with the extra long side handle keep this high torque drill under control when drilling large diameter holes. I purchased a reconditioned unit for the equivalent of about 3 weeks of fees at the local rental center and it looked brand new. I have had good luck buying reconditioned gear and I tend to trust this stuff because I believe that they have been carefully examined and all the defects removed. There's no doubt that this is a specialized tool, but if you have a lot of plumbing and/or electrical work to do than it may be worth getting. It will save you a lot of time, grief, and sweat in the long run. Powerful drill for heavy duty work! I have renovated several houses and a cabin. One of the tools I always needed was a right angle drill. I bought it and have put it to use drilling holes for electrical wiring and running pipes for plumbing. This is a powerful 1/2 inch drill which will let you drill in between studs, joists and other tight spots. I strongly recommend the Milwaukee Selfeed bits which assist in the drilling process by drawing the bit into the wood. I bought the plumbers bit kit which includes a great selection of the Selfeed bits and auger bits in a convenient carrying case. The only down side to this drill is that it will wear you out if you are using it all day lifting it up overhead. This tool has tremendous torque, so make sure you have good footing and use care while drilling because this tool can literally rip itself out of your hands. But if you are using this tool, you are looking to do some serious hole drilling. You will never go back to a regular drill with a spade bit or hole saw. No wonder you will find this tool in almost every electricians and plumbers tool inventory. A jobbers standard drill for many years. I have had the last iteration of this drill for the past 3 years. It's a great tool. I've used a lot of the others, but this one feels the best (though I haven't tried the Panasonic). It has plenty of torque and the metal Lok-Tor chuck is really solid. You can feel and hear the jaws locking, and they grip better than most of the others. Also, the metal chuck ring doesn't get all cut up when you have to run it into metal boxes, beams, etc. When I read that the battery could be installed from either side I thought it was just marketing hype. But this ended up being a really nice feature. Not only can you move the battery out of the way if it hits something, but changing the mounting position changes the tool balance. Unless the battery gets in the way, I always keep it in the "backward" position because it feels so much better (a personal preference choice you don't get with the other guys). When and if this thing ever dies, I'm getting another Milwaukee. I think that this is the best balance of power and weight. I use them all the time. Never hear of the problems that the one person had. I also have other Mil. tools and they are top notch.They are very solid tools. Fortunately, I have a job of advising people in drill purchases. What makes this drill so special is the 465 ft/lbs of torque in a 14.4 volt battery. A bit of weight is saved with minimal power loss. In comparing this drill to other drills, it is more powerful than the competing 18 volt yellows. The metal ratcheting chuck is a nice sign of the quality of it. Notice the replaceable brushes, which Yellow lacks. Notice the quality of the fit and finish. The only downside is that the 14.4 batteries are only useful in the drill and the job site radio, as Milwaukee's 14.4 line is not as extensive as their 18 volt line. As for the warranty, it can't be touched. Yellow has been downright stingy on their warranty lately, with some shoddy construction on a couple of recent drills I have seen. The bottom line, better than a DeWalt 18, in a 14.4 version. This is a bit of overkill for a home user, but perfectly good for a contractor. I took a chance and bought this drill. Boy was it a mistake! Anyone who uses this drill professionally or on a daily basis will not find it adequate. The housing of the drill is cheap, the seam where the two halves of the drill come together splits apart slightly under high torque driving and actually pinches your skin. A slight fall off the top of a two foot stepladder split the case apart and missaligned everything. Recently while drilling a 7/8" hole with a spade bit the drill just quit working. I returned it to the big box to hear I wasn't the only one wanting my money back. I will be returning to the P-C which gave three years of tough service before it gave out. I bought this drill but ultimately decided to return it and go with the hammer-drill version. Even though I don't use the hammer function much, I went with the hammer drill because the hammer function increased the length of the drill's nose. The longer nose decreased the angle between the handle and the chuck so that the drill can be pointed in a tight area without the handle and/or battery hitting an obstacle. Of course, you can get extension pieces for driving screws and some bits, so the longer nose is probably a minor point. 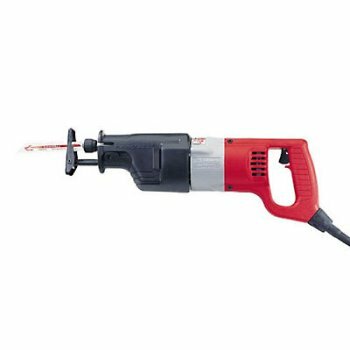 But without such attachments, the longer nose and reversible battery (which is a feature of both hammer and non-hammer drill models) allow the hammer-drill version to access tight areas where the handle/battery would interfere a little better. On the downside, the longer nose increases drill's overall length, making it more difficult to insert into tight areas where the drill's motor & chuck length is the limiting factor. 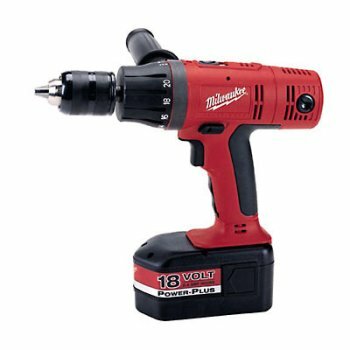 I compared this drill to the 14.4 volt Bosch Brute Tough drill, and I preferred the higher rpms that Milwaukee offered. Bosch has a better warranty on its battery (1.5 years compared to Milwaukee's 1 year), but Milwaukee's lifetime warranty on the drill beat Bosch's 3 year warranty. Although I was impressed by Bosch's durability claims, I found many similar testimonials on the Milwaukee website that attest to their drill's toughness (stories of people dropping them from heights or driving over them with construction equipment). The Bosch drill's case had a compartment to hold Bosch drill bit cases-you just snap them into the space provided. Although the Bosch kit included a screwdriver bit holder and small metal ring attached to the back of the drill, I found the removable side handle included in the Milwaukee kit a more useful option. If you want to tether the Milwaukee drill like the Bosch, there is a small ring built into the lower back of the Milwaukee drill's handle that can accommodate a tether. Just buy some thin cord at a rock climbing shop and tie a loop to the ring. If you're mainly interested in driving screws, then an impact driver/wrench such as the cordless Milwaukee 9083-22 might be what you're after. In hindsight, I wish I would have bought one of these. The 9083-22 has much more torque, is more compact, and is better at driving screws. With the proper chuck, it can also be used to drill. For an interesting demonstration of impact drivers, check out the video on cordless impact drivers on the Fine Homebuilding magazine website. Interestingly, if you quickly release the trigger on Milwaukee cordless drills, the braking mechanism will shoot sparks out of the rear vents. At least this is what happens when the drill is brand new. Well, first off, let me tell you that I have been working in metal for over 8 years, mainly for my mothers buessness (I am 13, and I have been welding Mig since I was 3) I also have loved tools my hole life. Well, this is the best and probably only sawzall you well ever need. I live in albuquerque and I have been having to cut down dead pinion and Pine trees, some even eight inches in diameter, weiging maby 150 lbs. and this saw, with the proper blade, does not even break a sweet. My old craftsman saw could not even compair. Right at first when you start it up, it sounds like a tiger prouncing on its pray. When cutting wood, you bearly hear a difference in sound from the motor. It has a strong breze of air from the motor, so I know it is cooling down very well. Putting the blade in is super fast , even a monkey could figure it out. Putting the blade in only takes about 3 seconds. Only one let down, it has no trigger lock. But that is a spit in the ocean compaired to all of the other features. Deffenitly buy this saw, even if you have another one. I do not use power tools in my line of work. However, I do have an appreciation for good quality equipment. I also believe that having the right tool can make even a home improvement project much more enjoyable. I bought this tool to cut some metal pipes and also some PVC pipes. Sure, I could have done the job with a hack saw. But, using a hand tool would have meant lots of patience and hassle. What would have taken a lot of time, sweat, hassle, and aggravation only took a few minutes with the Sawzall. The unit operated silently and it did not have as much vibration as I had expected for a unit with no counterbalance. A reciprocating saw is a very versatile tool even if you do not intend to do any kind of demolition. In addition to cutting pipes, you can also cut landscape timber and prune trees. Basically, you can use the Sawzall for just about anything that you would normally use a hand saw. The Sawzall came with two blades. One for metal and one for wood. It also came with a wrench to adjust the shoe. All of that came in a red kit box. The high quality kit box itself is made of sturdy, blown red plastic. The power cord is thicker than what I saw in competing brands at the same price range. The red Milwaukee kit box also seems sturdier, and there is a place inside that is specifically designed to hold extra blades. Most importantly, the saw itself looks and feels the way a heavy duty tool should. This kit defines high quality for a reasonable price. There were plenty of DeWalts, Hitachis, and Makitas at Lowe's. I chose the Milwaukee because I wanted to try out their brand. I suspect that any brand would have sufficed for my modest needs. This Sawzall might be a bit of an overkill for my intended use. However, I believe you will not regret buying more quality than you need. It is a hassle to have to drag out the orange extension cord. I chose a corded model because I wanted to have enough run time and power in order to be able to complete any project that might come my way. I was also hesitant to buy a cordless kit which would require a lot more investments in batteries in the future. If your intended use is strictly light duty, then perhaps a cordless model might be a more convenient choice. For its quality, reputation, design, package, and value, this Sawzall gets a five star rating from me. At a price of 119.99, this saw would be tough to beat. The closest competitor, in terms of power ratings, features, and price would be the Hitachi 13V. However, based on what I have seen of Hitachi's cases, I chose the Milwaukee. I place a lot of value on the design and quality of the case, as well as aesthetics. In the immortal words of Johnny Dangerouslly. I am restoring an 1840 colonial house, which requires as much demolition as it does construction. I have yet to come across something this thing cant cut. PERIOD. 4" cast iron pipe..... Butter. and lack speedlock blade clamps, but the older Sawzall design (from which this one is derived) has been proven through decades of hard professional use and design evolution. For its useful combination of compactness, power, versatility, and durability this tool hasn't been equalled by any other make. The only thing I would miss if I had to use this newer version is the oldfangled offset blade adapter for sawing flush along walls; the adapter won't fit the newfangled quick clamp. All hail the Sawzall! We love it! That was enough to convince us and we picked one up for ourselves. So far we've found it great when tearing up our bathroom and trimming thick branches away from our roof.We also felt our purchase was validated when our electrician's weapon of choice was a Sawzall for installing conduit and a ceiling fan in our first floor bathroom. We look forward to using it to get started on the do-it-yourself projects upstairs this fall. It has a neat "quik-loc" blade release mechanism..its installs without any tedious key mechanism, but is very secure. It's variable speed trigger works very well for a variety of situations. The only limitation we found is that the saw only comes with two blades...metal and wood. For owners of old homes, we're recommend getting special plaster blades. 10 amps is great power, even for the heavier duty work of cutting plaster & lathe. I have used this saw for over a year on everything from a large home addition to furniture building, and it's never missed a beat! The saw has the power to tackle even the hardest hardwood with ease, yet is precise enough to cut the tiniest fraction of an inch from a piece of soft end stock. This unit really stands out with its' fit and finish, from its bomb-proof red outer shell to its precision machined aluminum sole plate. The rubberized hand grips,Tilt-Lok feature, and surprisingly light weight allow for hours of use with maximum comfort. For those looking for the ultimate in power and precision coupled with tremendous durability and longevity - this is your saw! This is a little bit more than I expected. I had read previous reviews before making the purchase. One held that the case was too large. I appreciate the case size as I'll be able to put plenty of accessories in it. One also mentioned that it was a bit noisy. I find the noise level to be less than the average blender. One also seemed to denegrate the "tilt-lock" handle feature. This is the real neat part of the design, along with the comfort forward handle. The sole plate is top-notch and the power is all there for most any application. I used to work for a manufactured housing company on a road crew and all our hand power tools were Milwaukee. We put them through the grinder in all kinds of weather. I hope this one holds up as well. From looking at all the features and construction I expect it will. 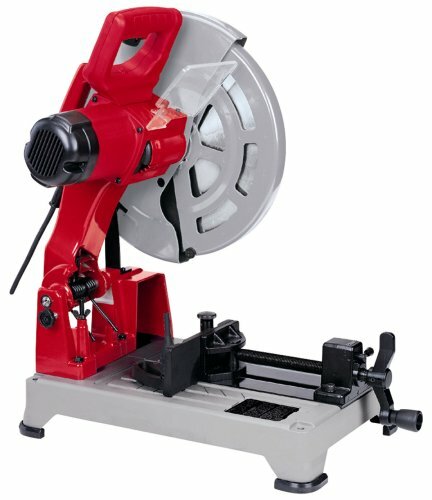 First I want to direct you to go read impartial reviews of the most popular circular saws done by a large crew of framers at www.shop-for-circular-saws.com , this is a very helpfull site. My review is as follows : I bought this saw new to replace my old beater, and I must say it has excellent power and is built very solid, great quality, it effortlessly cuts through everything I have used it on. BUT it's one big problem which is so annoying that I am unwilling to use it anymore, and will sell it because of, is that it seems designed to direct it's stream of sawdust directly at your face. It blasts chips and dust at your face and under your chin and down your shirt collar. Every time I use this saw I end up leaning out of the way in the most akward positions just to avoid this. I have used many circular saws and never had this problem, sure you will always get dusty but nothing like with this one. I hate this saw for this reason alone. Keep in mind that this saw is a "blade on the right side of the motor" unit and it might be better for left handed users as far as the dust in the face problem. I must admit I have not heard this problem mentioned by anyone else in any reviews so maybe I'm crazy, but I know can't make another cut with this thing. I will be replacing it with a Porter Cable 743-K(Blade on left) saw, which was the top pick at www.shop-for-circular-saws.com and is the lightest available. Good luck. My older version of this saw has been completely satisfactory for many years of heavy use. The plainer, older machine evidently differs from this one mainly in its thick, utterly flat aluminum base and a linear (not pivot) cast aluminum depth/bevel adjustment, features I looked for as I had long used Porter Cable's similarly designed saws. Quality construction and conservative engineering have always been hallmarks of Milwaukee's best products. I bought 2 of these cordless screwdrivers years ago to help me in my job as a mechanical engineer and product designer. I kept one for myself and the other was for everybody else! It proved invaluable when assembling complex prototype instruments. I eventually bought a second battery pack, a drill chuck and a 1/4" socket adaptor with various nut driving sockets. I'd forgotten about that wonderful tool until I recently had to disassemble, clean and reassemble a banjo with 50 brackets. The screws that held the brackets were very tight and after struggling with a few I remembered that fantastic screwdriver. I happily found that Amazon was selling an ideal set; screwdriver with two battery packs, drill chuck, and 1/4" adaptor in a great case. I find that it is really an indispensable tool if you do a lot of screwing (pardon my English). The banjo came apart and went together most handily. I ordered a number of long hex sockets to fit the various sizes of banjo nuts, and I'm delighted every time I use it. The torque setting lets me pick the right value to appropriately tension the bracket screws. All in all, I'm delighted with this tool and very highly recommend it to anybody dealing with assembly of many fasteners. It is also a very handy light duty electric drill. Do you work in or own a auto repair or body shop? If the answer is "yes" then you have answered another question also, "Do I really need one of the cordless screwdrivers?". I own a automotive repair shop and I honestly do know what I would do without my three Milwaukee 6547-22 2.4-Volt 2-Speed Cordless Screwdriver!!! Other than batteries, this tool is going to last you a long, long time. Its compact size will speed up productivity by getting in those tough to reach places like under the dash and engine compartment. Great tool!!! I've had an original single-speed AEG version of this 2.4 V cordless driver for 15+ years and have been very happy with it. I've had to replace the battery several times over the years (the Milwaukee batteries fit), but that's to be expected with NiCD batteries. I recently ordered the 2-speed Milwaukee version in a case with 2 batteries and a chuck. Unlike earlier examples of the Milwaukee package I've seen, the charger in this new package does NOT have the drop-down side door with 3 screwdriver bits inside. In fact, the package has ZERO screwdriver bits included - a BIG mistake in my opinion. In addition, the Jacobs chuck included with my package is defective. It arrived gunked/rusted and wobbles a great deal. I plan to return this set and stick with my old single speed driver. I bought this driver about a year ago and it has performed better than I expected. I have used it to drill holes and drive screws in 60 year old plaster. I have been a skeptic about the capability of lower voltage cordless tools but this little gem has power to spare and is what you would expect from Milwaukee. The new "Super Hawg" is what all hole drills should be. As a Southeast Texas homebuilder I put it through it's paces and it has turned some of the dreaded work into pleasure. I shopped all of the hole drills before chosing this one. It costs a little more than the others but it is worth it. I am very impressed with it's high quality construction, power, and comfort. The swiveling trigger handle is a feature all hole drills should have. The more powerful motor, (almost twice the competition), is put to good use running the drill at higher RPM's than all of the competitor's. This is one fast hole drill. I ordered the 3107-8 because it has two variable speed settings- 0-355 and 0-750. The carrying case said model 3107-8 but inside was a model 1107-1 which is 0-500 RPM only. Very disappointed. An elcellent drill to be used in those tight corners and spaces where any other drill & bit will no go. Right angle head rotates through 360 degress to aid in those tight spaces. With the ability to drill stright as well this "specialized" tool is not. Typical Milwaukee construction. Just finished a 3500 sq.ft. home wiring job. Worth every penny and then some for timely completion especially with owner changing partitions nearly daily. For years, Milwaukee's Sawzalls have been valued for their outstanding ability to cut through almost any material: wood, nail-embedded wood, steel, cast iron, aluminum, brass, drywall, composition materials, hard rubber, cement, brick, plaster, and fiberglass. The Super Sawzall features variable-speed control, with a speed control dial for faster cutting and better efficiency and control over a wide range of materials and applications. The blade is reversible, too, allowing you to cut upside down in tight spaces. For those of you who've grown up with Sawzalls, you'll appreciate the addition of the handy Quik-Lok blade clamp, which lets you change blades quickly without having to use a hex wrench; this feature is especially convenient when you're cutting hard materials, such as steel, a situation in which blades break frequently. There's also a handy quick lever adjustment for the shoe. This is the best sawzall I have ever used. there is very little viberation in the tool. The quick change for the blades is wonderful and very time saving. I don't know why I didn't buy this saw before. I bought the Milwaukee 6537-22 to repair some damaged soffits. try the Sawzall on it. It cut through the tree with no problem! the tool from the blade, then pushed the section of tree over. This is going to be a much used tool. A great product! Before I bought the 6537-22 model I had used one rather reluctenly. My previous experience with a tool of this kind was less than remarkable except that it vibrated like crazy. The Milwaukee was so quiet and so vibration free, I knew I had to have one. I am very pleased and would recommend this product to anyone. It's unbelievable until you use it. This was one of those tools that made me say "Why didn't I get one sooner?" If you can't think of something to get for a fellow that has everything, believe me he won't be disappointed with this. Recently I cut through 4 one inch hardened steel rods which were welded onto a stainless steel plate. I actually cut through the weld itself. It took about a 1/2 hour each but in the end the Sawzall lived up to it's name. Everyone knows that sawzalls can cut through almost any material: wood, nail-embedded wood, plaster, metal, (steel, cast iron, aluminum, black pipe, conduit, etc.) drywall, plaster,... you get the idea. When I used this to cut through floorboards and 2x4's it was as smooth as a hot knife through butter. Unistrut and allthread were also no match for this machine. This sawzall also has the new Quik-Lok blade clamp which allows you to change blades in seconds rather than minutes. There's no more searching for a hex wrench to change blades here. I would have given this drill a 30 star, but amazon only goes up to 5. This is the best drill I have ever owned. Perfect for the contractor, or maby the person who needs an drill. I know that this will be in my family for many, many years to come. There is only one draw back, it has a lot, or mabey even more than a lot of torque. It drove a 6 inch screw indo a piece of 4x4 with no piolet hole. And it did not even stop going apter I let off the triger, it drove it about 2" into the wood and cracked my workpiece. But all that set aside, DO buy this drill. I picked this drill because I knew it would handle anything I asked of it around the home. It is my third drill over the last fifty years and know it will still do the job by my Grandsons long after I ever stop using it. It is a little heavy on the tip and so a little off balance but the extra handle compensates for that. Wish the lock on button was raised a little higher as it requires a strong and skinny finger to engage it. Otherwise, best tool I've ever owned. I've used many brands of drills and always come to the same conclusion: There is no drill as good as a Milwaukee. There are less expensive brands of drills but they are of lesser quality. Buy a Milwaukee and have no regrets, it's the best, and made in the U.S.A. This dril is incredible. It's powerful enough for any job a hand drill can do. It is a very smooth drill that is comfortable to hold. I have used it with large auger bits in treated lumber and it doesn't bog down at all. I picked up this drill at home depot based on a review of corded high amp 1/2 inch drills in tools of the trade magazine. It has features and power that leave the competition in the dust. It was time to replace my 30 year old Craftsman scroller saw, and I read a review of the Milwaukee jig saw that rated it very high. I bought one about two months ago, have used it several times, mainly during a kitchen remodeling, and I find it to be everything Milwaukee claims it to be. It cuts through wood like butter, is much quieter than my old saw, and blade changes are a snap with the T-shank blades. The only problem I have had with is the clear plastic shield in front of the blade, and the plastic 'anti-splinter device', both of which occasionally fall off the saw. It has a very long cord for a portable power tool, which is very convenient, and comes with a nice carrying case and a plastic shoe cover. 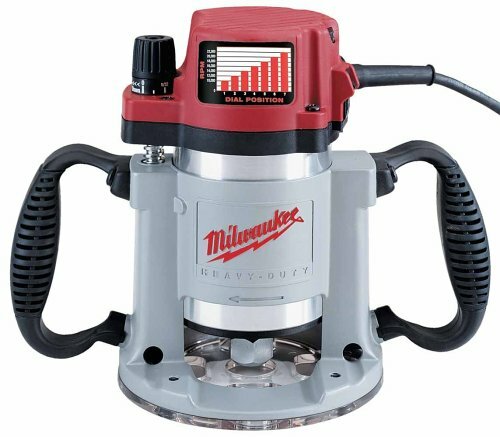 Milwaukee lists an edge guide/circle cutter attachment for it, but apparently it is not yet available. This saw is made in Germany (maybe by Bosch? ), and I'd recommend it to anyone. This is a follow-up to my previous long-winded review. I gave it 5-stars this time, so the average will be 4.5. I'm still not happy about the non-variable trigger, but this saw has noticeably less vibration than the Bosch. Even though the Bosch could start at lower speed due to the variable trigger, the Bosch still jumped quite a bit when transitioning from stopped to the lowest speed possible by slowly squeezing the trigger. So there was no advantage there. Once running, the Milwaukee was smoother. And everything about the Milwaukee's adjustments is just better. For example the shoe tilt is tool-less, the positive stops are better, and the non-marring shoe cover doesn't require a bunch of screws. So I'm now returning the Bosch to get back the Milwaukee again. Another reviewer sited the lack of trigger controlled variable speed as a reason for returning this saw and choosing another brand. I typically don't like to contradict other reviewers as everyone has their own technique and application. I would, however, like to offer a bit of a different insight into the matter. When negotiating an intricate cut, any change in SPM will impact the accuracy of the cut. I always find it advantageous to maintain a constant speed throughout a cut. Maintaining a constant speed can be difficult when the speed control is integrated with the trigger. When performing an intricate cut your grip pressure often increases and decreases in and out of the turns. An increase in grip pressure can result in more displacement of the trigger and subsequently a sudden change in SPM (and an inaccurate cut). I personally like the fact that Milwaukee has made the speed adjustable via a separate control. Unlike the other reviewer, I have not noticed high torque jumps with this saw. When I need to restart a cut I always insure that I have backed the saw sufficiently away from the uncut material. This is a great saw, and though it initially seems that trigger integrated speed control would be convenient I think the separate speed control is a well thought out design. Perhaps Milwaukee may want to implement a soft-start feature if it is widely perceive that start-up torque jump is an issue. Personally I wouldn't find such a feature valuable enough to merit an almost certain increase in price. 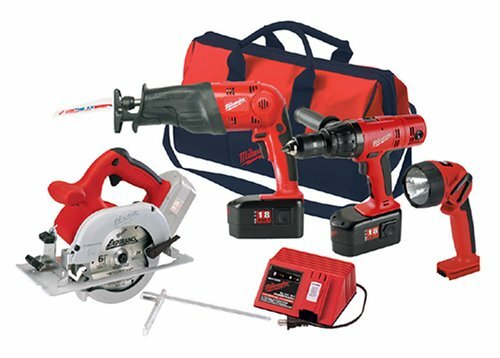 Milwaukee & Bosch Team Up to Create a Winner!!! Other reviewers have done a good job identifying the individual strengths and weaknesses of this saw. I've always been partial to Milwaukee tools and this jigsaw is one reason why. 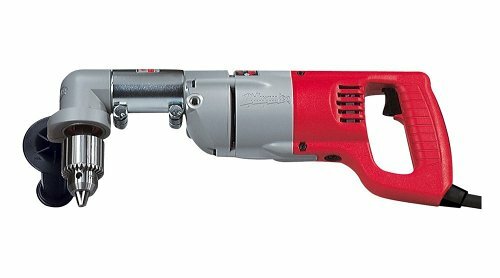 However, I thought that I'd point out one thing that other reviewers haven't mentioned: This saw was designed by Milwaukee; however, it is manufactured by Bosch in Germany (read the label.) It's hard to go wrong when the two best names in power-tools team up to create any saw. That's certainly the case with Milwaukee's 6266-22 jig saw. With Amazon's low pricing and free shipping, what are you waiting for? Get one now. You won't be disappointed. I bought this saw for a song from a local home improvement center where it was on the closeout table. It had been the display model and had no case and was missing the clear dust cover over the blade. I ordered the case ($24) for it and dropped Milwaukee an email about the missing dust cover. Less than a week later, the missing dust cover arrived in the mail at no cost to me. Kudos to Milwaukee for remembering what customer service is all about. It was a toss-up between this unit and the Bosch but what finally sold me on the Milwaukee was the blade change. The Bosch has the clumsy "lift-and-turn" lever on the top of the saw. I see great potential for breakage with this plastic lever. I note that last month Bosch introduced a new saw (1590EVSK) with a blade changing device that looks very much like the Milwaukee's.